Update: We’re developing & launching MicroFilters to improve MicroMappers. About 47 hours ago, the UN Office for the Coordination of Humanitarian Affairs (OCHA) activated the Digital Humanitarian Network (DHN) in response to the Pakistan Earthquake. The activation request was for 48 hours, so the deployment will soon phase out. As already described here, the Standby Volunteer Task Force (SBTF) teamed up with QCRI to carry out an early test of MicroMappers, which was not set to launch until next month. This post shares some initial thoughts on how the test went along with preliminary results. During ~40 hours, 109 volunteers from the SBTF and the public tagged just over 30,000 tweets that were posted during the first 36 hours or so after the quake. We were able to automatically collect these tweets thanks to our partnership with GNIP and specifically filtered for said tweets using half-a-dozen hashtags. Given the large volume of tweets collected, we did not require that each tweet be tagged at least 3 times by individual volunteers to ensure data quality control. Out of these 30,000+ tweets, volunteers tagged a total of 177 tweets as noting needs or infrastructure damage. A review of these tweets by the SBTF concluded that none were actually informative or actionable. Just over 350 pictures were tweeted in the aftermath of the earthquake. These were uploaded to the ImageClicker for tagging purposes. However, none of the pictures captured evidence of infrastructure damage. In fact, the vast majority were unrelated to the earthquake. This was also true of pictures published in news articles. Indeed, we used an automated algorithm to identify all tweets with links to news articles; this algorithm would then crawl these articles for evidence of images. We found that the vast majority of these automatically extracted pictures were related to politics rather than infrastructure damage. A few preliminary thoughts and reflections from this first test of MicroMappers. First, however, a big, huge, gigantic thanks to my awesome QCRI team: Ji Lucas, Imran Muhammad and Kiran Garimella; to my outstanding colleagues on the SBTF Core Team including but certainly not limited to Jus Mackinnon, Melissa Elliott, Anahi A. Iaccuci, Per Aarvik & Brendan O’Hanrahan (bios here); to the amazing SBTF volunteers and members of the general public who rallied to tag tweets and images—in particular our top 5 taggers: Christina KR, Leah H, Lubna A, Deborah B and Joyce M! Also bravo to volunteers in the Netherlands, UK, US and Germany for being the most active MicroMappers; and last but certainly not least, big, huge and gigantic thanks to Andrew Ilyas for developing the algorithms to automatically identify pictures and videos posted to Twitter. So what did we learn over the past 48 hours? First, the disaster-affected region is a remote area of south-western Pakistan with a very light social media footprint, so there was practically no user-generated content directly relevant to needs and damage posted on Twitter during the first 36 hours. In other words, there were no needles to be found in the haystack of information. This is in stark contrast to our experience when we carried out a very similar operation following Typhoon Pablo in the Philippines. Obviously, if there’s little to no social media footprint in a disaster-affected area, then monitoring social media is of no use at all to anyone. Note, however, that MicroMappers could also be used to tag 30,000+ text messages (SMS). (Incidentally, since the earthquake struck around 12noon local time, there was only about 18 hours of daylight during the 36-hour period for which we collected the tweets). Second, while the point of this exercise was not to test our pre-processing filters, it was clear that the single biggest problem was ultimately with the filtering. Our goal was to upload as many tweets as possible to the Clickers and stress-test the apps. So we only filtered tweets using a number of general hashtags such as #Pakistan. Furthermore, we did not filter out any retweets, which probably accounted for 2/3 of the data, nor did we filter by geography to ensure that we were only collecting and thus tagging tweets from users based in Pakistan. This was a major mistake on our end. We were so pre-occupied with testing the actual Clickers that we simply did not pay attention to the pre-processing of tweets. This was equally true of the images uploaded to the ImageClicker. So where do we go from here? Well we have pages and pages worth of feedback to go through and integrate in the next version of the Clickers. For me, one of the top priorities is to optimize our pre-processing algorithms and ensure that the resulting output can be automatically uploaded to the Clickers. We have to refine our algorithms and make damned sure that we only upload unique tweets and images to our Clickers. At most, volunteers should not see the same tweet or image more than 3 times for verification purposes. We should also be more careful with our hashtag filtering and also consider filtering by geography. Incidentally, when our free & open source AIDR platform becomes operational in November, we’ll also have the ability to automatically identify tweets referring to needs, reports of damage, and much, much more. In fact, AIDR was also tested for the very first time. SBTF volunteers tagged about 1,000 tweets, and just over 130 of the tags enabled us to create an accurate classifier that can automatically identify whether a tweet is relevant for disaster response efforts specifically in Pakistan (80% accuracy). Now, we didn’t apply this classifier on incoming tweets because AIDR uses streaming Twitter data, not static, archived data which is what we had (in the form of CSV files). In any event, we also made an effort to create classifiers for needs and infrastructure damage but did not get enough tags to make these accurate enough. Typically, we need a minimum of 20 or so tags (i.e., examples of actual tweets referring to needs or damage). The more tags, the more accurate the classifier. The reason there were so few tags, however, is because there were very few to no informative tweets referring to needs or infrastructure damage during the first 36 hours. In any event, I believe this was the very first time that a machine learning classifier was crowdsourced for disaster response purposes. In the future, we may want to first crowdsource a machine learning classifier for disaster relevant tweets and then upload the results to MicroMappers; this would reduce the number of unrelated tweets displayed on a TweetClicker. As expected, we have also received a lot of feedback vis-a-vis user experience and the user interface of the Clickers. Speed is at the top of the list. That is, making sure that once I’ve clicked on a tweet/image, the next tweet/image automatically appears. At times, I had to wait more than 20 seconds for the next item to load. We also need to add more progress bars such as the number of tweets or images that remain to be tagged—a countdown display, basically. I could go on and on, frankly, but hopefully these early reflections are informative and useful to others developing next-generation humanitarian technologies. In sum, there is a lot of work to be done still. Onwards! Update 1: MicroMappers is now public! Anyone can join to help the efforts! MicroMappers was not due to launch until next month but my team and I at QCRI received a time-sensitive request by colleagues at the UN to carry out an early test of the platform given yesterday’s 7.7 magnitude earthquake, which killed well over 300 and injured hundreds more in south-western Pakistan. Shortly after this request, the UN Office for the Coordination of Humanitarian Affairs (OCHA) in Pakistan officially activated the Digital Humanitarian Network (DHN) to rapidly assess the damage and needs resulting from the earthquake. The award-winning Standby Volunteer Task Force (SBTF), a founding member of the DHN. teamed up with QCRI to use MicroMappers in response to the request by OCHA-Pakistan. This exercise, however, is purely for testing purposes only. We made this clear to our UN partners since the results may be far from optimal. 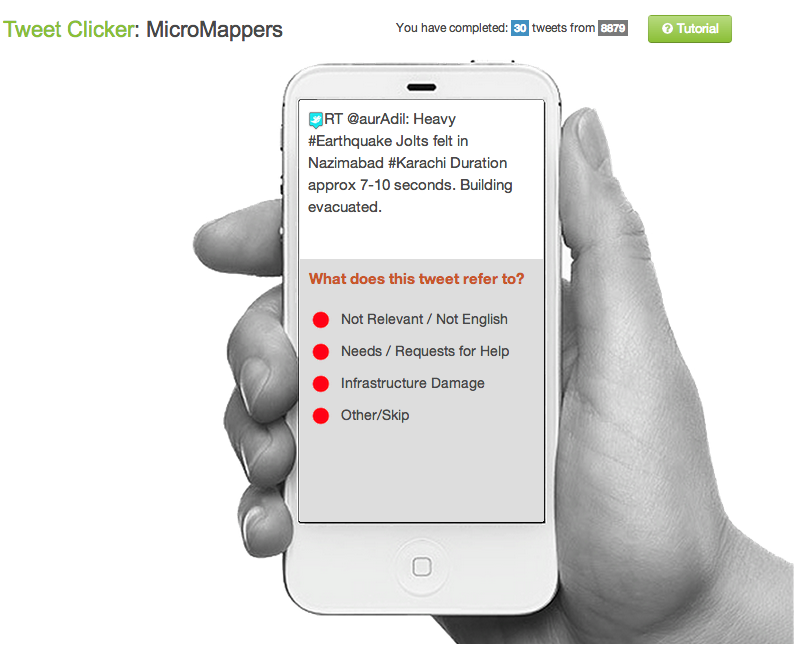 MicroMappers is simply a collection of microtasking apps (we call them Clickers) that we have customized for disaster response purposes. We just launched both the Tweet and Image Clickers to support the earthquake relief and may also launch the Tweet and Image GeoClickers as well in the next 24 hours. The TweetClicker is pictured below (click to enlarge). Thanks to our partnership with GNIP, QCRI automatically collected over 35,000 tweets related to Pakistan and the Earthquake (we’re continuing to collect more in real-time). We’ve uploaded these tweets to the TweetClicker and are also filtering links to images for upload to the ImageClicker. Depending on how the initial testing goes, we may be able to invite help from the global digital village. 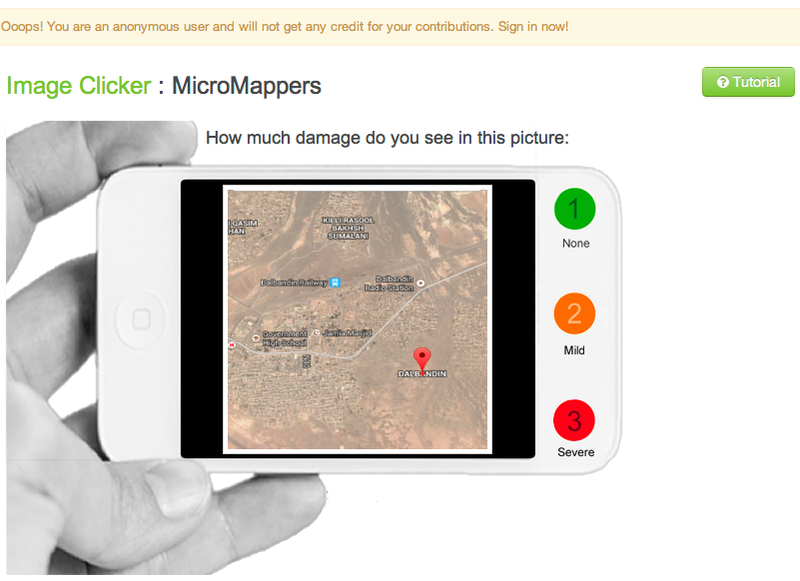 Indeed, “crowdsourcing” is simply another way of saying “It takes a village…” In fact, that’s precisely why MicroMappers was developed, to enable anyone with an Internet connection to become a digital humanitarian volunteer. The Clicker for images is displayed below (click to enlarge). Now, whether this very first test of the Clickers goes well remains to be seen. As mentioned, we weren’t planning to launch until next month. But we’ve already learned heaps from the past few hours alone. For example, while the Clickers are indeed ready and operational, our automatic pre-processing filters are not yet optimized for rapid response. The purpose of these filters is to automatically identify tweets that link to images and videos so that they can be uploaded to the Clickers directly. In addition, while our ImageClicker is operational, our VideoClicker is still under development—as is our TranslateClicker, both of which would have been useful in this response. I’m sure will encounter other issues over the next 24-36 hours. We’re keeping track of these in a shared Google Spreadsheet so we can review them next week and make sure to integrate as much of the feedback as possible before the next disaster strikes. Incidentally, we (QCRI) also teamed up with the SBTF to test the very first version of the Artificial Intelligence for Disaster Response (AIDR) platform for about six hours. As far as we know, this test represents the first time that machine learning classifiers for disaster resposne were created on the fly using crowdsourcing. We expect to launch AIDR publicly at the 2013 CrisisMappers conference this November (ICCM 2013). We’ll be sure to share what worked and didn’t work during this first AIDR pilot test. So stay tuned for future updates via iRevolution. In the meantime, a big, big thanks to the SBTF Team for rallying so quickly and for agreeing to test the platforms! If you’re interested in becoming a digital humanitarian volunteer, simply join us here. A few days after the Haiti earthquake, Ushahidi‘s Brian Herbert set up a dedicated website to crowdsource the translation and geo-location of text messages from Haitian Kreyol to English. This allowed thousands of volunteers from across the globe to help out in the disaster response. We need something similar for crisis mapping Pakistan but Mechanical Turk style. I coined the term “turksourcing” a while back to mean crowdsourcing applied to micro-tasks. See this previous blog post for a quick introduction. A colleague from Pakistan recently launched this Crowdmap and short code to map flood related incidents. What I’d really like to see happen now is the development of a Turksourcing plugin for this and any other crisis mapping initiatives in Pakistan. The idea would be to set up a simple website where incoming text messages could be pushed to for tagging and geo-location. Volunteers would use their email address and a password to access the platform. Once they login, they simply select an incoming SMS which they tag based on pre-set categories like those displayed on the Crowdmap for Pakistan. Volunteers would also map the location of the incident being reported. They would then press submit and move on to the next text message. Each SMS would have to be validated by 3 or 5 volunteers before being officially mapped. This means that a given text message is only mapped if 3+ volunteers have each assigned the SMS the same tag(s) and approximate location. This is to ensure the quality of the data. If a given user consistently mis-tags/geo-locates incoming text messages, their contributions could be automatically ignored. (As opposed to barring them from the system which would prompt them to try and game it some other way). Volunteers could also be awarded points for each correctly tagged and geo-located SMS. A public scoreboard could be displayed with the rank of most prolific volunteers to create further incentives to help out by rewarding turksourcing efforts. This introduces a gaming component to crisis mapping as I blogged about here. Colleagues of mine with Revision Labs in Seattle have termed this “Playsourcing”. The map below represents the location of volunteers who helped out with the Kreyol text messages in January. There’s no reason why we can’t rally volunteers around the world to do the same for the 20 million affected Pakistanis. I have touched base with friends at Stanford, Crowdflower and with CrisisCommons and hope someone will be able to develop a quick turksourcing plugin for crisis mapping Pakistan and future disasters. Please do get in touch if you have bandwidth to take this on or help out. My email address is patrick at irevolution dot net.